The cast of I Like It Like That. Photo by Marisol Diaz. BOTTOM LINE: A lively musical about the 70s that's a true feast of salsa packed with exhilarating fun and the people’s genuine love for El Barrio. In El Barrio, salsa flows in its people’s lifeblood: the Nuyoricans breathe the music and move with the rhythms. The new musical I Like It Like That tells a simple, moving story set against a complex historical background. The plot centers around Roberto’s Record Shop, and sets the changing neighborhood against the backdrop of 70s-era NYC. We see different attitudes towards the neighborhood from the various characters, but one thing is common: the love they have for their community. Record store owner, music connoisseur, and the respected head of the family Roberto (Tito Nieves) and his wife Carmen (Shadia Fairuz) have four children: Juan (Gilberto Velazquez), China (Caridad De La Luz), Carlos (Joseph ‘Quizue’ Gonzalez), and Paula (Ana Isabelle). Juan, the oldest, is the pride of his parents, yet gets involved with the wrong crowd and ends up incarcerated for three years. China transforms herself from the innocent little girl who follows her brothers around, to a social activist whose love for the neighborhood urges her on to make a difference. Carlos is the law school student who dreams of leaving the neighborhood for a better life. Lastly, their youngest Paula is a breath of fresh air and the joy of the family. Secondary characters include Tita (Rosemary Almonte) and Rafa (Angel Lopez), who light up the stage with their scenes; their comedic romantic subplot wins roaring laughter throughout the show. Also noteworthy is the versatility of Chachi Del Valle, who portrays Juan’s paramour Maria Luisa, Babilonia the stereotypical Puerto Rican abuela, and La Lupe, a raucously funny salsa club dancer. Fast-forward three years, and Roberto’s family is reunited with Juan, in the midst of preparing for Paula’s sweet sixteen. The mood is celebratory, but the issues between the residents and the city intensify as we learn about the negligent police, the poor sanitation of the residential buildings, and the neighborhood gangs threatening the locals. At the end of act one, residents join forces to protest the government: the image of young Paula burning trash on the street, and raising her fist with passion while still wearing her pink fluffy princess dress, is one of the most powerful moments of the musical. In I Like It Like That, the songs and dances are organic elements of the characters’ lives, rather than theatrical gimmicks to get an arousal out of the audience. There are quite a few traditional numbers in the musical, to which many in the audience sing along. English subtitles are projected on the set for the Spanish songs. However, not understanding Spanish does not hinder the enjoyment of the show, except for perhaps missing the occasional joke. The production successfully illuminates a slice of life from El Barrio at a specific turning point in history, when the neighborhood, as well as the whole city, went through drastic changes. A red brick wall, a major part of Raul Abrego’s set for the show, is simple yet effective. Rocco Disanti’s projection designs both vary conditions of this wall, and also transform it to reflect different neighborhood locales. I Like It Like That has much to offer in diversifying New York's musical theatre scene. 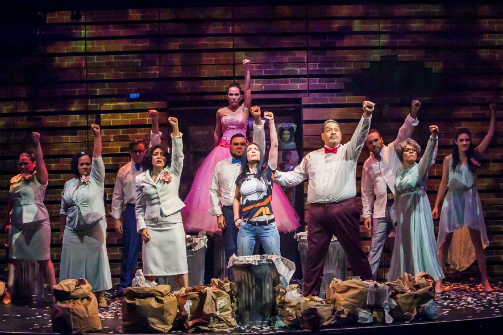 The show captures the sweet and sorrowful essence of its characters, and is also a joyous time capsule of El Barrio in the 70s; its accurate portrayal of the Nuyorican community wins vocalized approvals from the audience. Fitting well alongside Baz Luhrmann’s recent series The Get Down, I Like It Like That will hopefully gain plenty of commercial success, both in and beyond the Latin American community, because “yeah baby,” who wouldn’t want an evening of non-stop fun. I Like It Like That is by David Maldonado and Waddys Jaquez. Directed by Waddys Jaquez with Musical Direction by Desmar Guevara. Scenic Design is by Raul Abrego. Lighting Design is by Lucrecia Briceño & G. Benjamin Swope. Sound Design is by Julian Evans. Projection Design is by Rocco Disanti. Costume Designer is Hochi Asiatico. Jonathan Maldonado and Grisel Del Valle are associates Choreographers. The band includes Bobby Allende, Anthony Carrillo, Jorge Castro, Guido Gonzalez, Desmar Guevara, Jerry Madera, and Hommy Ramos. The cast is Rossmery Almonte, Caridad De La Luz, Chachi Del Valle, Shadia Fairuz, Joseph 'Quique' González, Ana Isabelle, Sofia Klimovsky, Angel López, Tito Nieves, Yesenia Santiago, and Gilbert Velázquez.